Today marks a dubious anniversary in my life. On this date last year, I was flat on my back, having just received a one-word explanation for why I felt like I’d been run over by a Mack truck: mono. It had been a whirlwind of a month leading up to the diagnosis. Within the span of just a few weeks, the man of my dreams put a sparkly thing on my finger and asked me to marry him; I went on a cruise with my future in-laws; and shortly thereafter I hopped into a minivan with my family for a cross-country trip to meet my new nephew. All this while in the throes of planning a wedding scheduled for less than six months away. It’s little wonder, I suppose, that I found myself unable to get out of bed one morning not long after the whirlwind subsided. One of the worst parts about the mono (aside from the fire in my throat and the relentless teasing about how I’d contracted “the kissing disease”) was the solitary nature of it. I couldn’t go to work; I didn’t want to contaminate my friends and family; and based on the swollen state of my adenoids, even talking on the phone sounded like torture. With a warning from the doctor about a six-week recovery time, suffice it say I was feeling pretty lonely. Daniel faithfully came over to my house when I was sick, bearing gifts of throat spray, Tylenol, chicken noodle soup, and ice cream (purely for medicinal throat-soothing purposes, of course). But the best gift he gave me was his presence. When the Israelites were on the long road from slavery in Egypt to the Promised Land, they had plenty of needs—basics like food, water, and physical safety. But they also had a need for something deeper from God: his company. Once the thrill of freedom wore off, I’m sure it didn’t take long for them to panic and realize they were in the middle of the desert and didn’t exactly have a map to show them where they were going. They didn’t just need physical supplies; they needed God to sit with them, even when they were mopey and unshowered and in general just lousy company. They needed the comfort of God’s presence. This need was reflected in Moses’ prayer for his people: “O Lord, if it is true that I have found favor with you, then please travel with us. Yes, this is a stubborn and rebellious people, but please forgive our iniquity and our sins. Claim us as your own special possession” (Exodus 34:9). And that’s just what God gave them—in the form of a cloud by day a pillar of fire by night. That gift wasn’t so different from the gift I received in my sweatpantsed-state. It’s the gift of love. It’s the gift of presence. Over the years I’ve presented God with a number of scripts for my life, largely fleshed out and filled with contingency plans where necessary, just waiting for his stamp of approval. What with him being so busy running the universe and all, I figured I was doing him a favor. To date, God hasn’t followed a single one of those scripts. He has unceremoniously scrapped my plans about my career trajectory, where I was going to live, and notably my marriage/children timeline. As I look back on the pattern of God’s work in my life, I notice a distinct pattern: I always ask for the straight line, the shortcut. And he, almost without exception, takes me the long way around. When the Israelites were set free from their slavery in Egypt, I’m guessing they, too, assumed they’d go right from point A to point B, with no detours along the way. After all, God had just performed ten miracles in the form of dramatic plagues, and now he’d promised them a land of their own. Surely he’d take them straight there, right? As it turned out, the “roundabout way” wasn’t something God did to his people out of spite. It was, without question, an act of grace. He used the detours to protect the Israelites and to build their character along the way. In retrospect, I’m grateful God hasn’t accepted my life plans. In each scenario, he knew I wasn’t ready for point B yet. There was still some work he wanted to do inside me before I could make it in that new destination. And looking back now, I know that if I’d taken the shortcuts, I’d have missed out on some of the richest parts of my life. So, God of the Detour, I hand over all my scripts to you. Let me embrace not just the Promised Land you’re leading me to but also the roundabout way you’re taking me to get there. My friend Liz is Jewish—“real Jewish,” she’d tell you, meaning she grew up in Israel. She and her mom moved to the United States when Liz was in high school, in large part so Liz wouldn’t have to serve in the Israeli army—something of an automatic draft for all 18-year-olds, male or female, in her country. I met Liz shortly after she moved here, near Passover time. Since most of the people I knew of who celebrated Passover were long-dead guys like Moses, I was intrigued to hear how she and her family marked the holiday. The thing that usually struck me when I read the account of the first Passover was the rather somber tone of the event. Honestly, it didn’t sound like my idea of a holiday to be packed up and ready to flee, eating “with urgency” (Exodus 12:11). Not quite a relaxing family gathering at Grandma’s house. On a deeper level, the premise itself seemed less than festive: blood painted around the doorframe of each Israelite home, and with it the dark undercurrent of knowing every household in Egypt would be visited by the angel of death that night. I asked Liz about Passover, in all my Goyim ignorance. Does it ever seem strange, I wondered, to celebrate a holiday whose main event is a nation-wide slaughter? Liz bit her lip, trying unsuccessfully to hide her smile. Oh, right. Hence the name. If you don’t know what you’re getting saved from, I suppose the grace, the celebration, doesn’t mean much. And now, many generations after that first Passover, the same can be true for us—Gentiles and descendants of Moses alike. The blood of the Lamb has covered the doorframes of our hearts. And as a result, the angel of death no longer has power over us. We, too, will be passed over. 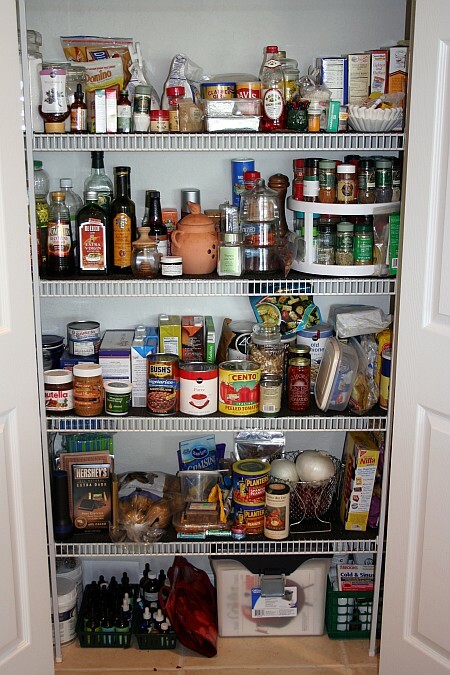 I might as well be up front with you from the beginning: I have a pantry problem. And a freezer problem too, for that matter. I guess you could blame it on the fact that I come from an ancestral line of farming women who knew how to can and pickle and pantrify and store up for winter with the best of them. Even today, if you went to my grandma’s house, you’d find a stuffed freezer upstairs, plus another full freezer and a huge deep freeze in the basement—all of them stocked with goodies. I missed the farming and canning gene, but I sure got the freezer gene. If my husband and I don’t have a backup of everything in the pantry, and if our freezer door can close without heroic efforts, I start getting vaguely antsy. I do realize I live in the era of Costco and Super Walmart, not Little House on the Prairie, but I can’t seem to help myself. That’s probably, I’ve been realizing lately, because there’s a spiritual component to my neurosis. The stocked pantry and freezer give me a false sense of security…like if I can control what’s on the shelves, I somehow have more control over my life. I wonder if that’s why God implemented the manna diet for the Israelites when they were wandering in the desert. At first glance, this story in Exodus seems to one of straightforward provision: the Israelites are hungry; God gives them food. But on closer reflection, I find it interesting to note his process. He doesn’t give them a yearly or monthly or even weekly supply of food to store up on. No, he gives them what they needed for today. Moses told them, “Do not keep any of it until morning.” But some of them didn’t listen and kept some of it until morning. But by then it was full of maggots and had a terrible smell. Every morning when the people woke up to find manna scattered on the ground, it was a reminder that they weren’t in control, that they could stock their pantry all they wanted to, but ultimately they were dependent on their Provider.